During an impromptu stroll around the galleries on a snowy January day, I was drawn in by an intriguing image that I had not noticed before in a gallery that was originally the Phillips family home’s West Parlor. The scene before my eyes was not dissimilar from the one unfolding outside. Gustave Courbet’s Winter in the Jura (c. 1875) appeared just as breathtaking as the fresh snowfall outside. Rather than belonging to a particular school or movement, Courbet is perhaps better known for his lack of association with any one group. His work is neither strictly Romantic nor Neoclassical, and Courbet believed the popular style of History painting to be a waste of his time. 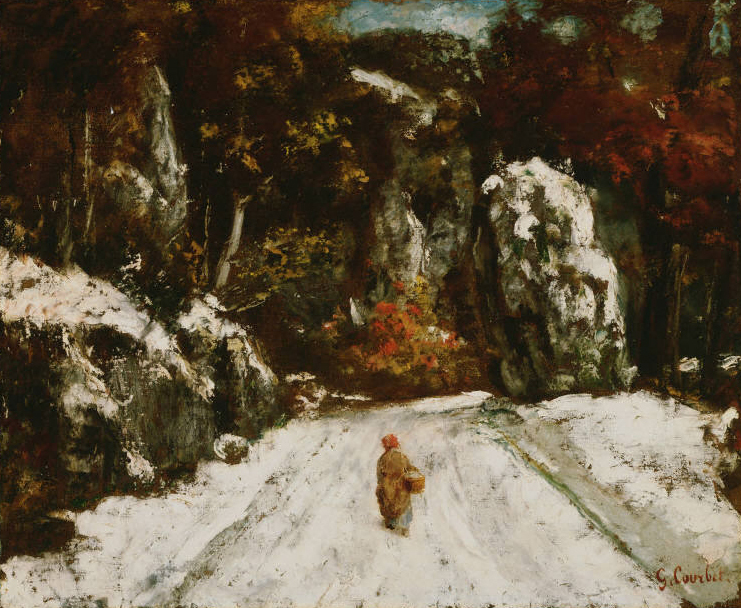 Instead, Courbet aimed to “…in short…create living art,” which he has certainly done successfully in Winter in the Jura. The painting has a life-like quality that goes beyond any kind of hyperrealism. The special silence of a snow-covered morning has been captured perfectly. In the work, a single figure trudges through the picture plane towards a bend in the road. Flecks of red draw the viewer’s eye to what remains of the foliage in the Jura Mountains. As a native of one of the snowiest cities in the US, I’ve developed a level of comfort that comes along with snow, which Courbet conveys perfectly through Winter in the Jura. Artists like Courbet—who refuse to be pigeon-holed into one category—are often the most valuable to our art education, but also to the development of art as a whole. There is certainly something exceptional about a painting which stirs something familiar in a first-time viewer. The artist with this special capability must possess the “power of conception” and “sacred knowing” that Courbet so often mentioned in letters to friends. In this way, Courbet made himself truly free from the restraints of institutions as he always wished to, holding power to “…address the people directly” in self-portraits and scenes of snowy mornings.